So if I pay $120 for a Spotify Premium account, it means that i can listen to a lot of songs. If I pay $120 worth of songs from iTunes in Australia, I can only listen to 70 songs. In Australia, we are charged $1.69 for a track. As a fan of music what is the better option. However, for the artists that were doing well under the old record label controlled system, then Spotify and iTunes is probably not for them and they should retire. For the larger group of artists that didn’t have the six winning lotto numbers in the record label lottery, then Spotify is the leveller. Spotify is changing the distribution of wealth within the music business. 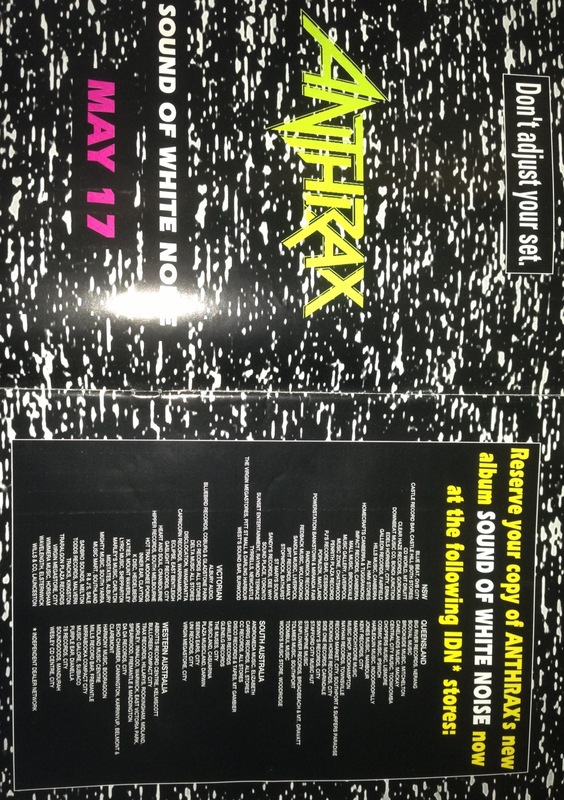 Scott Ian from Anthrax can get his fans to go to all of the stores mentioned above. I trust that none of them are around anymore. It wasn’t piracy that killed them off, it was new technologies and bad business models. The major chains all could have innovated, however they didn’t. Steve Jobs and Apple did. Daniel Ek and Spotify did. In relation to the record labels. Imagine all the poor artists that were on Geffen Records in 1992. Talk about Geffen hedging their bets. 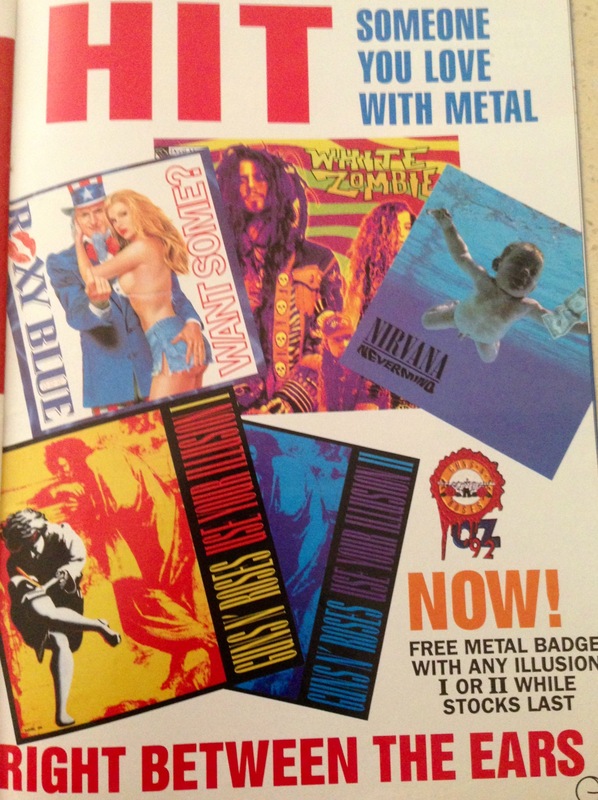 That flyer is promoting Guns N Roses and Roxy Blue (Hard Rock) vs Nirvana (Grunge) vs White Zombie (Industrial Groove Metal). Guess we know who was the loser overall. Hard Rock. The internet has enabled artists to reach out to wider and different communities than they could in the past. Previously, artists had to connect with people nearby and wait on the record label to spread the word. However in 2013, many more artists are able to connect and build a fan base by finding and bringing together a unique fan base that is right for them and them alone. Protest The Hero just did it with “Volition” and their Indiegogo campaign. Coheed and Cambria did a great job with “The Afterman” releases. Digital Summer is doing a great job at it as a DIY artist. Marillion started it off in 2001. With everything there has to be a leader and for fan funding, that leader was Marillion. The purpose of music is not to make people rich. It was always about the social bonding. If an artist can accomplish the bonding part, then the artist is giving the fan a reason to buy. It is human nature to reciprocate, to acknowledge value. All those artists complaining, that they are losing, is because they are obsessed with the money they are losing. They have no one to blame but themselves. They are losing money because they no longer are making connections. They are just offering a piece of music up for sale without any connections and relationships. That is the bad way. Heard it on YouTube. I dig what this band does. They don’t follow convention. It’s only one song so far, from an album that was financed via Indiegogo. I am proud to say I am one of many that contributed. The website Classic Rock Revisited conducted an interview with Yngwie Malmsteen recently. The interview was aimed at promoting Malmsteen’s new biography. Malmsteen is one musician who is not afraid to share his opinions. His recent opinions on the state of the music industry has polarised the internet. The mere mention of the word “piracy, and music” a reaction is always forthcoming. This is what used to happen. Any musician that wanted to write songs and have those songs released to an audience, had to meet that “guy with the big cigar.” In no way did a recording contract guarantee an artist success. Yngwie Malmsteen seems to forget that between the period of 1983 to 1988, he released an album each year in order to get name recognition. The reason why he got name recognition is because he had the songs and two great vocalists in Jeff Scott Soto and Joe Lynn Turner. In the end, as good as Malmsteen is on the guitar, if the song sucked and if the vocals sucked, he would have remained in the underground. The same way you always have done it. Create great songs. In the end, it is the songs that will sell you. Regardless of how good you play your instrument, if the songs are not making a connection with people, then nothing will happen. The only difference is that bands these days, don’t need to play 2000 shows to get traction. Look at bands like Heartist and Digital Summer. Heartist is signed to Roadrunner and Digital Summer is all DIY. Both bands have decent traction. Heartist built their following online. Digital Summer did it in a hybrid way. Starting out before the MySpace craze, they did it with feet on the ground, handing out flyers and playing shows. When technology started playing a part in promoting and marketing a band, these new opportunities got filtered in to their workload. FACT – MTV used Heavy Metal music as a means to get traction. Look at the clips produced by hard rock / metal bands. Twisted Sister, had “We’re Not Gonna Take It” and “I Wanna Rock”. Motley Crue had “Smokin In The Boys Room”. Van Halen had “Hot For Teacher.” All of those clips were game changers in the video format. As soon as MTV got traction, they booted metal music and put it back to a monthly/weekly segment that would become Headbangers Ball. FACT – Music is getting released on a grand scale today. With so much new music out there fighting for listeners attention, artists need to give fans a reason to listen to their music. By saying that they put their heart and soul into it, just doesn’t cut in this day and age. You need to have great songs. Look at the band Periphery. The band got traction via message boards. Has piracy stopped the band? I saw them live in Australia this year at the Annandale Hotel in Sydney. Look at the band Shinedown. They came out in 2005, when piracy was rampant. Has piracy stopped the band from becoming a giant in the hard rock scene? They have two albums that have sold over a million units and two albums that have sold over 500,000 units. Singles on the other had have moved in the multi-millions. Look at the band Digital Summer. They came out in 2005, when piracy was rampant. Has piracy stopped the band from touring and releasing new music? They are all DIY and have total control over their affairs. Even bands that had major deals have asked the band to represent them. Look at the band One Less Reason. Another DIY band. One of their albums has gone GOLD. Has piracy stopped the band from touring and releasing new music? Look at the band Protest The Hero. While they were signed to a label, they were told that never made any money. Finally they broke free from the label and started an Indiegogo campaign, raising over $300K (with the goal being $120K). Has piracy stopped the band from touring and releasing new music? I love Malmsteen however he is a confused albeit funny individual. He is putting a lot of information out there without any thought. If anyone was treated like dirt by record labels, it was Yngwie Malmsteen. Elektra chased him, signed him to a large deal and then dropped him cold after one album. During the Nineties, no label in the U.S would touch him. If it wasn’t for the Japanese market, Yngwie would be broke and destitute and without a career in 2013. As much as Malmsteen is seen as a musical dictator, he knows it deep down, that if he didn’t conform and write more accessible songs, then his career would have been over. That is the power that the labels held over the artists. Classic Rock Revisited: The Internet changed a lot for the industry; piracy has certainly had a hand in changing the game. Do you think that piracy can be beneficial to some of those bands starting out? How has it affected you? Yngwie: How could it possibly be positive? If you go into a store and you see a car that you like, you can’t just drive off with it. The cost and the blood and sweat and tears that go into making music is the same thing, it’s not free. Try telling the engineer and the producer that they have to work for free. It’s utterly bizarre. It’s like just going into a store and taking things off the shelves. It’s stealing. The reason there are no bands coming out now is that the money that was once there is not there anymore. So what happened was, in essence, by pirating music, you kill the music industry. The music industry died because of the piracy, and now all the fans will have no new music. Isn’t that wonderful? It’s a direct consequence of that. Again, Malmsteen is confusing the recording industry with the music industry. The recording industry is not dying. It has changed. The labels made the most money from selling the LP and then the CD. So when fans could pick and choose what tracks they wanted to buy, the biggest cash cow for the labels became obsolete. Licensed streaming is gaining traction. Unlicensed streaming on YouTube is bigger than ever. If the recording industry listened to advice back in 1998, maybe it would still be as powerful as it was back then. However, they ignored the advice. The whole stealing analogy has been shot down a billion times. Maybe Scott Ian, Duff McKagan and Yngwie Malmsteen should form a band called “Steeler.” Oh wait, Malmsteen was already in a band called Steeler. It’s simply economics. Digitised music equals less CD’s. The MP3 made music easy to share and distribute just by the click of a mouse button. Chart success and sales of actual music is not as relevant today as it was back in the Eighties and Nineties. What is relevant today is what music of the band are fans listening too. Look at the band Shinedown. Call Me is their most streamed track, however they do not play the song live. Finally, the best part of the interview, the quotes. Shifting Thoughts with Evergrey, Dream Theater and Five Finger Death Punch – Are Corporate Deals the New Music Business? The internet is flush with information about artists needing to do what is valuable to them. However what is valuable to them doesn’t always mean that it is valuable to everyone else. So artists are always going back to square one. This is when artists will start to compromise their artistic vision and produce cookie cutter crap. However what an artist should be doing is to keep on writing. In the end, that valuable song will be written and it will translate to your audience. This is when the thing that you love to do, translates to an audience that loves what you do. Evergrey is a Swedish progressive metal band. They are eight albums in so far. Their first album The Dark Discovery came out in 1998 and the most recent one Glorious Collision came out in 2011. The mainstay of the band is guitarist/vocalist Tom Englund, who also functions as the main songwriter in the band. Around him, band members come and go, with the most recent change happening in 2010. Englund is remaining true to his artistic vision. He is not compromising on it and he is not changing his vision to chase any current trends. Drummer Jonas Ekdahl and guitarist Henrik Danhage left Evergrey in 2010 to form a metal core outfit called Death Destruction with the lead singer from another Swedish band called Dead By April. Chasing trends. It all comes down to what the artist wants to achieve from their career. Englund is all about the art and to me it seems like he is happy with the level of success he has. Would he like to be bigger? I am sure the answer would be YES to that, however would he complain about his lot in life. I think not. Englund is doing the thing that he loves to do and he has found an audience that loves what he does. Bands like Coheed and Cambria, Digital Summer and Protest The Hero all get it. Digital Summer is all fan funded. They have been around since 2006. They have toured strategically since inception as all the band members hold down full time jobs. They are three albums and one EP in so far and based on their business model, they will be around for a long time. Protest The Hero is also fan funded. Their recent Indiegogo campaign more than tripled their goal (and YES I am one of those fans that donated). They have even rewarded the super fans that have shared the contribution link and gotten other people to contribute with additional perks. Coheed and Cambria are a very fan centric band. The way they have packaged The Afterman releases with the digital downloads available on the day of release, along with demos and back stories of each song, as well as an 80 odd page hard cover book is just brilliant. They did it their way and with a price that was just right. Dream Theater is one band that is sitting on the fringe here. They are still doing it the old way as they know their fan base will lap up the new self-titled album. Their recent co-promotion with mainstream entity USA Today to launch their new single The Enemy Within is just another corporate deal in the same vein as Jay Z partnering with Samsung. USA Today offer a certain amount of dollars so that they are the exclusive and first on line website to premier the new song. By doing this, Dream Theater, their label, their manager and whoever else has a stake in the band will get paid up front and USA Today will get traffic to their website which they can then use to get a higher ad revenue from their advertisers’. Before all the DT Forum Elitists start jumping up in arms and start calling me an idiot, every band is entitled to earn money in any way they see fit. This is no different to Dire Straits and Phillips teaming up in the Eighties, to push the new CD format onto consumers. If that what Dream Theater’s business model needs them to do, good on them. In the end the fans will decide the fate of the band, as they have done for every band that came before and that will come after. Five Finger Death Punch did something similar were they teamed/partnered with Loudwire to produce a track by track webisode series. The Five Finger Death Punch co-promotion was super cool as it focused on delivering back stories to each of the songs. As a fan, it is those little extra details that I really like. That could be the reason why Five Finger Death Punch have reached Gold status with each album release. Those little things, like a track by track webisode.